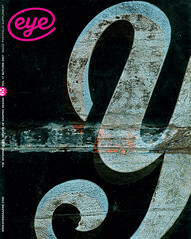 Thank you very much for the publication of the in-depth interview about Decodeunicode in Eye 64. We received some nice feedback from the US, Portugal and Australia. Our ‘unique visitors’ statistic has nearly doubled since the publication of the article, and a font distributor has now proposed supporting our project. In July, we had more than 200,000 unique visitors.